Completed projects and things to come. We have now completed the illustration of the planes on the aluminium composite panel. The artwork consisted of 3 planes in total, two of which were the Merlin and the Hawkeye planes which we originally airbrushed. Reproducing the actual murals that we airbrushed on the planes at a much smaller scale, where the owl mural was a total height of 3cm and the Merlin and Hawkeye no larger than 6cm, it was really challenging to paint them accurately and include all of the detail. Another recent completion was the Vrod front and rear fender, which completed the original artwork that we did ...the Phoenix Vrod tank. The artwork was real fire over a limited edition Harley Grind paint scheme. We airbrushed feathers burning within the flames which related back to the original Phoenix. We have many more exciting projects starting soon, one of which a completely themed Harley extremely involved as far as artwork is concerned it will be based around a Brain and Neuron theme. 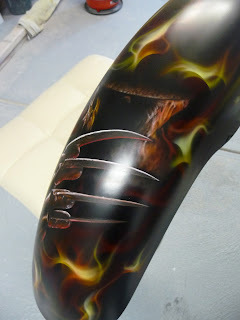 Here are some pictures of the recently completed Freddy Krueger Chopper. The artwork was airbrushed freehand using references supplied by the customer, we airbrushed the real fire to interact with the murals and to act as a border whilst keeping with the Krueger theme. Busy times here at Airbrush Asylum. We have been really busy lately, working on some exciting projects with many more coming soon. Our Vampire and Zombie half tanks have finally been completed and should be flowcoated by now ready to assemble on one of our display stands. We recently completed a key for a 21st present, which included a black and white portrait with lettering and fireworks all on a laser cut MDF key and finished with 2pack clear. The customer was really happy and his daughter was amazed by the present that she received. A Freddy Kreuger chopper has also been completed for one of our newest clients. 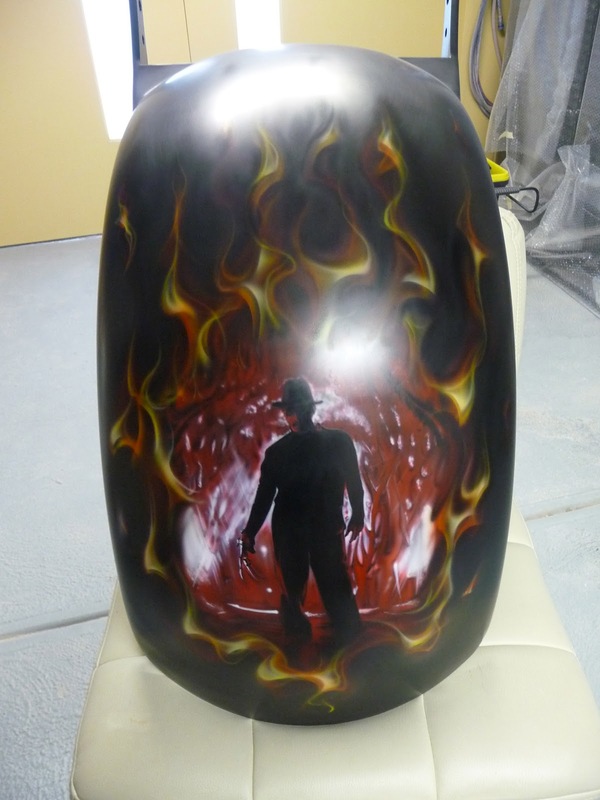 The customer requested an image of Freddy's face burning with realistic fire on either side of the tank, we also airbrushed Freddy walking from a burning red forest on the rear fender and a silhouetted Freddy showing off his glove all within realistic flames on the front fender.